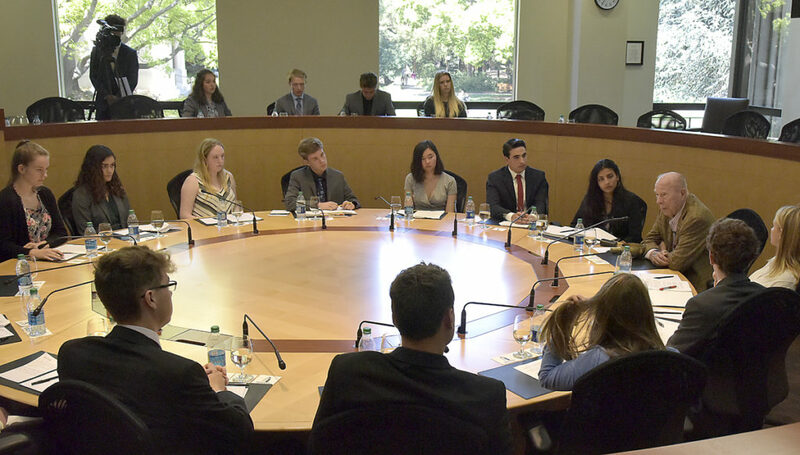 Last year during Values class, our teacher Ward Mailliard casually mentioned that former Secretary of State George Shultz is his uncle. I knew I had to ask him if we could interview Secretary Shultz. I didn’t think it was actually going to happen but I thought it was worth a try. A few weeks later, I got an email from Ward telling me that we had an interview arranged. I was extremely excited. and am still thankful for that opportunity. This year we had a second interview with Secretary Shultz, and just like the first time, I was excited. The interview was great. I don’t think I will ever speak to anyone as accomplished as Secretary Shultz. 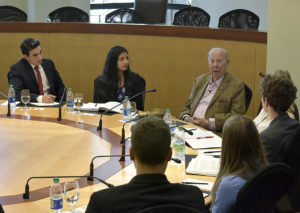 George Shultz is one of two statesmen in all of U.S. history who has served in four federal cabinet positions. Under President Eisenhower, he served as an economic advisor. Under President Nixon, he served as Secretary of Labor, Secretary of the Treasury, and the Director of the Office Management and Budget. Then, from 1982 to 1989, he served as President Reagan’s Secretary of State, the highest cabinet position under a presidency. While interviewing him, I had a difficult time believing who I was sitting next to. It was an honor to be listening to a man who played an integral part in ending the Cold War. What he has done for this country, from serving in combat in WWII to serving as Secretary of State during the height of the Cold War, is incredible. During the interview, he said something along the lines of, “You are known from the way you present yourself.” I think out of all people, he definitely has the authority to state this. He isn’t a well-respected man in politics because he did nothing; he demonstrated that he is a person who will get the job done, and deserves all the respect he gets. I am very grateful for being given this opportunity. 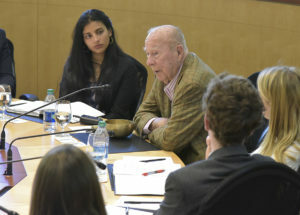 Interviewing George Shultz was one of the highlights of my senior year. The first time we interviewed him, during my junior year, I felt like I was under-prepared. However, this time around I did a lot more research in order to gain better insight into his life and stories. One of my favorite things he said during the interview was in response to a question asked by Imogen about immigrants. He paused a moment before he responded, and then started to speak about what it means to be an American. He discussed a painting of George Washington crossing the Delaware River, saying that most people notice George Washington but if you look at the rest of people in the boat there is great diversity. He spoke on the importance of diversity in the United States and how everyone is an immigrant from somewhere. Finally, he stated, “Anyone can come to America and become an American.” This stood out to me because it is one of things that makes the U.S. unique. Secretary Shultz can speak in a way that makes the most difficult problems seems clear and possible to solve. A topic of discussion in the interview was how to go about working at problems that we may never be able to fully solve. This was particularly inspiring coming from a man who has been working to solve the world’s problems his whole life. He is 97 years old and he is still discussing what he is going to do to solve climate change. It’s hard to imagine all the work he has done, and he still has the drive, wisdom, and willpower to continue to fight for what is right and beneficial to this world.